and many dozens more listed throughout the site. Additional individual contributors are listed within the Knutsen Archives, in the Forum Site Update threads, and in my frequent blogs. Harpguitars.net is the central worldwide web hub for all things harp guitar. It is funded by the nonprofit Harp Guitar Foundation, which depends on donations from readers such as you. It is the home of the Harp Guitar Gathering®, an annual music festival also supported by the Foundation. The site includes exhaustive sections on History, Players and Luthiers, along with extensive articles, photographs, music listings and a member's Forum. It strives to be non-"political" and all-inclusive. I, Gregg Miner, am your host. My bio and testimonials are below, and you can see my full harp guitar and other musical instrument credits on my personal web site. Consider all text, commentary and captions to be my own, except where otherwise noted. I have been helped by a small army of occasional volunteers (see list at left), and am always looking for more help from anyone with an interest in the instrument or with information and knowledge to share. I am supported in the Harp Guitar Foundation by Stephen Bennett, my wife Jaci Rohr and Frank Doucette. We are further supported by Gathering Assistants Joe and Linda Morgan and the Board of Advisors: Andy Wahlberg, Mike Doolin and Nancy Conescu. Mostly, I am supported by you. In the year 2000, an unusual site called harpguitars.com appeared on the web, the brainchild of Don Adams, a web designer and harp guitar aficionado. Including the first-ever public forum for harp guitar players and collectors, it featured a potpourri of harp guitar topics, and was imagined as the future central web location for everything related to the harp guitar. Unfortunately, after just two years, Don had to abandon the project, and it went offline by 2003. It was Don who helped plant the seed to create my own archival study site in 2002 on the instruments of Chris Knutsen, the "father" of our American hollow-arm harp guitar. That site quickly outgrew my wildest expectations, while at the same time I was discovering a huge amount of other unpublished harp guitar material scattered about. Added to all this was the ever-expanding harp guitar community, which took a new direction with the first annual (though we didn't know it at the time!) 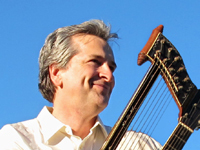 Harp Guitar Gathering®, founded by Stephen Bennett in 2003. I thus made the decision in April, 2004 to re-create and further expand Don's original concept into a new, permanent home for all things harp guitar: Harpguitars.net. The new site name was chosen after polling the community. The vast Knutsen Archives were folded into the History section of the site, which quickly became one of the largest single-topic online repositories known and shows no signs of being remotely complete. For its web presence, the Harp Guitar Gathering® (eventually trademarked) was also incorporated into Harpguitars.net from its inception. In May of 2009 - after five years of web site growth and six consecutive Gatherings - The Harp Guitar Foundation was created, designed as a 501(C)3 nonprofit corporation that would be the umbrella organization for both Harpguitars.net and the Harp Guitar Gathering®. This was largely made possible by the over 200 subscribers that had voluntarily contributed to my site over the last five years. Their remaining funds gave us a strong start and we begin our new future. My original "Manifesto" (to "serve, preserve and expand" the harp guitar world) has now been adapted into the Mission Statement of the new Foundation. The Foundation also resides on my original Harpguitars.net web site. Gregg Miner has been fascinated by harp guitars since the early 1970s. He purchased his first instrument (a 1916 red sunburst Gibson) in 1983 for $1500, which took him several years to pay back on his VISA loan. He fell in love with the harp guitars of Chris Knutsen when he found his first one in 1988. He collects harp guitars, researches harp guitars, writes about harp guitars, plays harp guitars, produces harp guitar CDs, buys and sells harp guitars, and currently runs Harpguitars.net, Harp Guitar Music and the Harp Guitar Foundation. You would think that by now he would be sick of harp guitars, but he is not. Miner’s other musical hobbies include an entire museum of plucked stringed instruments and recordings made with a hundred of the instruments, which can be seen on his personal web site. His many non-musical interests, you just wouldn't believe. He spends his days incognito as a Northrop Grumman manufacturing engineer. His wife since 1989, Jaci Rohr, has not only put up with all this nonsense, she now sits on the board of the Harp Guitar Foundation. They reside in southern California with two little dogs, neither of which has shown any aptitude for the harp guitar.